From Karel Čapek's play R.U.R., through Isaac Asimov's stories and novels revolving around his three laws, to William Gibson's Sprawl novels and the latest iterations of machine transcendence, science fiction has long explored existential questions about artifical intelligence. Can we construct a self-aware thinking machine that perfectly mimics human thought and affect? Would human-like machines actually be human, or would they develop their own agendas? So forth. 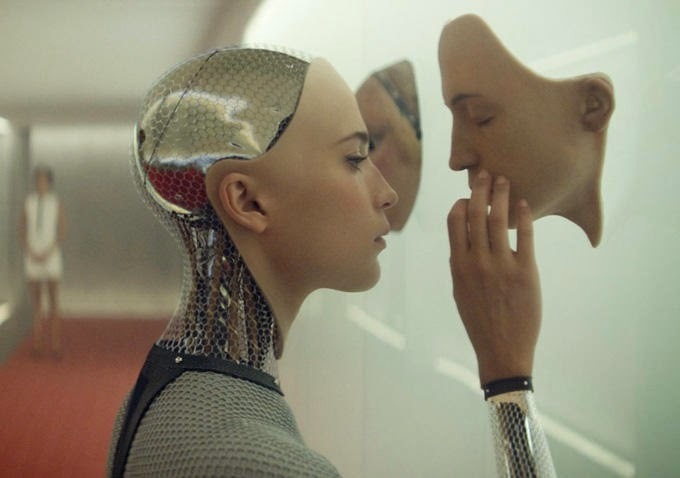 In his film Ex Machina, writer/director Alex Garland merges this theme with the scientist-as-creator-god trope most famously embodied in Mary Shelley's Frankenstein and H.G. Wells' The Island of Doctor Moreau. The resulting hybrid is a deft, tightly-plotted science-fiction thriller in which two geeks go head to head over a female android who not only appears to be self-aware, but may also be more cunning and manipulative than either of them. It's mostly set in a modernist one-man research facility in an isolated estate in Alaska, where a young coder, Caleb Smith (Domhnall Gleason), arrives after winning a lottery that gives him face-time with the boss of his search-engine company, Nathan. Played by the ever-versatile Oscar Isaac (Inside Llewyn Davis, A Most Violent Year) with a shaven head and hipster beard, Nathan embodies all the manic, macho, super-controlling vices of Silicon Valley's alpha-geekdom. He gives Caleb a pass that allows him access only to certain areas of the house, and tells him that the lottery was a sham: he's actually been recruited to test Nathan's latest creation, Ava, an android that may or may not be self-aware enough to pass for human. With only the overbearing, manipulative Nathan and his silent servant/bed companion Kyoko (Sonoya Mizuno) for company, Caleb soon falls for the coolly sympathetic and beautiful Ava (Alicia Vikander), assumes the role of her white knight, and enters into a contest of wills over her freedom. The film's examination of the nature of intelligence is capable rather than novel, but its story is furnished with cleverly unsettling twists and revelations, and there are some nice touches in the genesis of Ava - her silicon-sponge brain runs on data derived from Nathan's vast search engine, for instance, so that she embodies and has access to all of the desires and appetites of its users. And although she's the object of the contest between the two men, Alicia Vikander's delicately assertive portrayal of Ava steals the film. Moving with controlled and slightly inhuman grace, displaying unsettling sharp insights into human behaviour, Ava is an ethereal, poignant Miranda whose yearning for the whole wide world beyond the confines of her glass and concrete cage captures the sympathies of both naive Caleb and the audience. Alicia Vikander's performance is aided by CGI that seamlessly marries flesh with plastic and metal, a terrific example of state-of-the art visual manipulation. Given the ongoing difficulty of developing actual artificial intelligence, and recent advances in wearable virtual reality, perhaps the most pressing question technology presently poses is not how to spot machines passing for human, but how to distinguish illusion from the actual. I spent most of 2013 and a small chunk of 2014 thinking about and writing Something Coming Through; part of 2014 was also consumed by the processes that turn a manuscript into a book: editing, copy-editing and minutely inspecting proofs. And while I wrote and revised the first draft of a new book, the production and publishing process has been edging forward and suddenly, in less than a month, the thing itself will be in the shops. So it goes from the point of view of an author - slow, slow, quick, slow, and then the sudden birth. 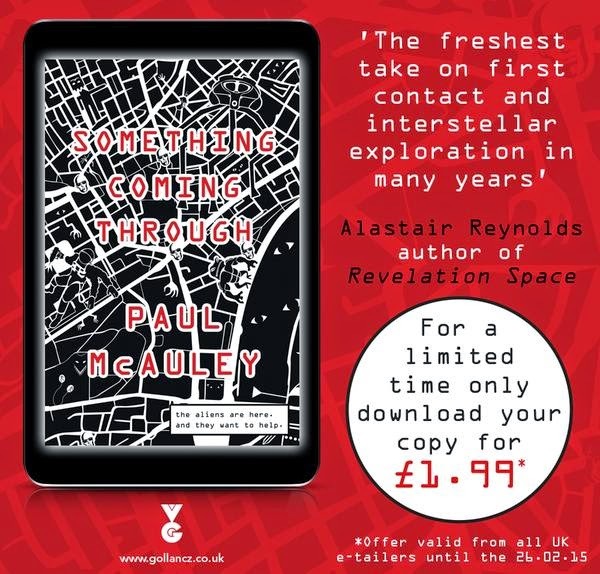 Gollancz are offering a special price for the ebook: you can pre-order it right now from all UK sellers for £1.99. So why not take advantage of their reckless generosity?